The Orioles closed out their three games series against the Yankees at Camden Yards with a loss last night, 4-0. Well, for Baltimore, not much happened at the plate. The only mustered three hits against New York starting pitcher, A.J. Burnett and they made him look practically unbeatable. Yes, in the end the Orioles lost by four, but in actuality, they seriously didn't put up much of a fight against the Yankees. Brian Matusz lost his first game of the season as he went six innings and gave up three runs - all earned. He did get in trouble a few times; however, he always seemed to find a way out of it. His effort was for naught as he teammates could not get anything going whatsoever. New York's Robinson Cano touched the Orioles for two homers in the game - both solo shots. Amazingly, the Orioles are already 13 games out of first place even before the month of May. Tonight, they face the Red Sox who have won three in a row to start a three-game set. If you are outside the Orioles and Yankees' home markets, don't have the Extra Innings package at home or access to MLB.tv on your computer, the MLB Network will feature the New York Yankees at Baltimore Orioles tomorrow, April 29, at 7:00 p.m. ET as part of its “Thursday Night Baseball” series. MLB Network’s Matt Vasgersian and Joe Magrane will call the game from Oriole Park at Camden Yards. The Orioles brief two-game win streak came to a crashing halt as the New York Yankees beat them, 8-3. New York pretty much decided the game within an hour as they scored six runs in the first three innings off a shaky Jeremy Guthrie, who fell to 0-3 on the season. The hurler who has shown some promise this season after a horrible 2009, struggled again. He only lasted 4 2/3 innings and was charged with seven runs – six earned, plus hit a batter (Jorge Posada who left the game soon after being hit on the knee). Of course, Joe Girardi was none too pleased to see his star catcher hit; however, Guthrie did apologize for beaning Posada and his poor night on the mound. On the other hand, Yankee starter C.C. Sabathia won for the third time season as he went 7 2/3 innings and gave up three runs; however, he gave up 11 hits. He wasn’t sharp in the least, but once again, the Orioles could do little against him. Baltimore scored a run in the third inning off an RBI-groundout from Miguel Tejada and another in the sixth off a Nolan Reimold sacrifice fly. Nick Markakis hit his first homer of the season in the seventh inning; however, the Orioles didn’t do much after that. Much like the night before, the attendance at Camden Yards last night was surprising yet again. Watching on MASN, the amount of people in the crowd at Camden Yards was stunning. For only the fourth time this season, the Orioles earned a win, this time beating the tough New York Yankees, 5-4, in the first contest in a three game series at home. The win on Tuesday was their first at home all season. Alberto Castillo got the win in relief, while Alfredo Simon – who was called up from Norfolk earlier in the day (Kam Mickilio was sent down) – got his first save in the majors, although he had a difficult challenge as two runs scored – none earned due to a Cesar Izturis error – and had the winning run at third. The scene was set for a Yankee comeback and yet another loss by the Orioles; however, Alex Rodriguez’s grounder to second with outs in the final frame closed out the game. A win is a win; however, the Orioles are going to a bullpen-by-committee for now to close out games until someone steps up and shows they can hold down the job. From what most have seen, Jim Johnson – despite his stuff – isn’t a viable closer based on his results on the field. Kevin Millwood started the game for Baltimore, but was yanked after 5 1/3 after racking up a high pitch count. He allowed two runs – the first in the third inning off a Miguel Tejada error and the second off a Jorge Posada homer in the fourth. He would not be a factor in the decision. Up 2-1, Yankee pitcher Phil Hughes, who started the game – coming off a near no-hit bid last week – came into Camden Yards and gave up a run in 5 2/3 before his bullpen blew it. WHAT: ESPN Zone and the Baltimore Orioles will launch this season’s Q&A series on Wednesday, April 28 at 12 p.m. At the free event, first-year Oriole Garrett Atkins will field questions from fans. Atkins, who spent his first seven Major League seasons with the Colorado Rockies, will chat with fans and answer questions about switching from third base to first, playing with Baltimore’s pack of young talent, and enjoying his new home in Birdland. The Q&A will be moderated by an Orioles broadcaster and will be followed by an autograph signing. Fans will also have the opportunity to win tickets to an upcoming game. This is the first in a season-long series of Q&A events, featuring up-close access to popular O’s players. Remaining Q&As will take place on the following dates: May 17, June 23, July 22, August 4, August 18 and September 15. This morning, 105.7 FM's 'The Mark Viviano Show with the Bulldog' show had retired pitcher Curt Schilling talk about a myraid of topics, including the Baltimore Orioles. If you get a chance, listen to the interview below. I should warn you, Curt isn't kind about the Orioles in their current state, he's awfully blunt about some things and he'll make you a tad upset; however, I appreciate his candor and a lot of it is the truth. Clip from the 105.7 FM website. A Sunday Win; O's Win One Against the Red Sox, 7-6 in 10. 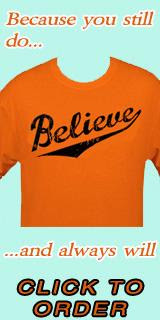 The Orioles managed to win today for only the third time in 19 games as they defeated the Red Sox, 7-6 in ten innings. They finaly snapped a ten game losing streak against Boston. Baltimore rallied in the tenth inning as they plated three runs, bolstered by a bases-loaded single by Rhyne Hughes in the 10th inning to break a 4-4 tie. Moments later, Matt Wieters plated in two with an RBI infield single. For one day, they put their troubles behind thanks to a combined team effort, although once again – the bullpen made things very, very interesting. God help them. I mean, the starting pitching has been solid, and bats are finally starting to wakeup bit by bit, but the bullpen ... my lord. With a 7-4 lead in the bottom of the 10th, once again fans had to worry. Jim Johnson after pitching a solid ninth inning could not get anyone out. He allowed an a RBI-double to J.D. Drew and a RBI-single to bring Boston, within one, 7-6. Dave Trembley yanked Johnson in favor of Cla Meredith, and in the end, the submariner got his first ML save and finished off Boston by getting the last two outs of the contest. Jim Johnson would win the game. David Hernandez started the game for Baltimore and didn’t get a decision as he went five innings and allowed three runs. He started the bottom of the sixth inning, but had trouble getting men out and by the time the frame ended, Boston would allow for men to cross home plate for a 4-1 lead. The Orioles bullpen has been completely unreliable all season. After blowing two games in Boston, to allow the Orioles to fall to an absolutely unholy 2-16, heads need to roll. Albers need to be gone, there has to be someone in the minor leagues that can come in and pitch for three innings. The Orioles have a wealth of starting pitching talent in the minors right now and some of that starting talent needs to be inserted into the bullpen. But that is not where it will end. Dave Trembley is probably not long for this season. And that is a crime. The Orioles blew yet another game last night as they folded in the seventh inning as the bullpen once again folded and allowed the Red Sox to come back and win, 7-6. Baltimore took a 3-1 lead into the seventh inning at Fenway Park and Brian Matusz – who once again was solid on the mound – ran into a jam and was yanked in favor of the bullpen. That decision would later turn into a mistake as both Mat Albers and Kam Mickolio could not bail out Matusz. They both would allow to storm back as they coughed up three run homers to Marco Scaturo and Kevin Youkilis. 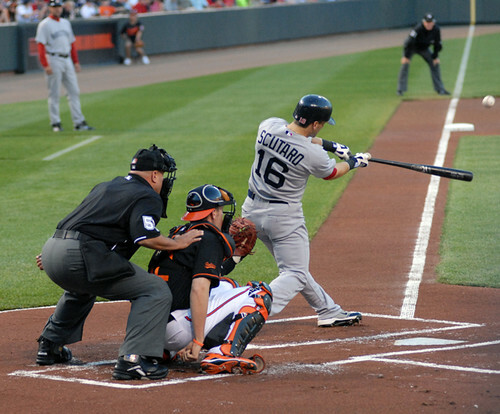 In the end, the Orioles would give up six runs in that fateful inning; however, they would rally back in the ninth inning – only to come up short. Adam Jones hit a solo shot to start the scoring in the final frame, and then the Orioles would get two more runs off Jonathan Papelbon as Matt Wieters and Luke Scott had RBI singles. When all was said and done, Matt Albers would take the loss. 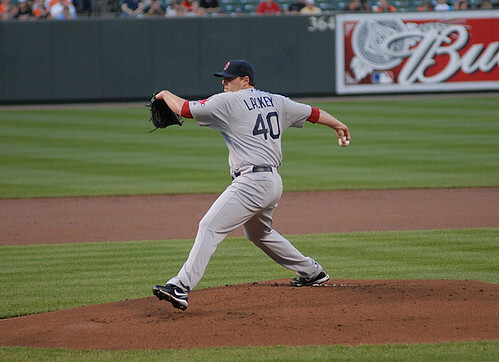 For Boston, starter John Lackey would earn the win, going seven innings and giving up three runs on ten hits. Papelbon got the save, his fifth. Brian Matusz was once again good on the mound for Baltimore as he went six innings and gave up three runs. However, should Matusz have been left in to work out of a jam? Maybe. If there were some positives of this game, it had to be the debut of Rhyne Hughes. The Orioles were desperate for power – or much less anything on the offensive front and the new guy delivered. He went 2-for-5 in his major league debut, drove in a run in the second, and got a hit in his first ML at bat. 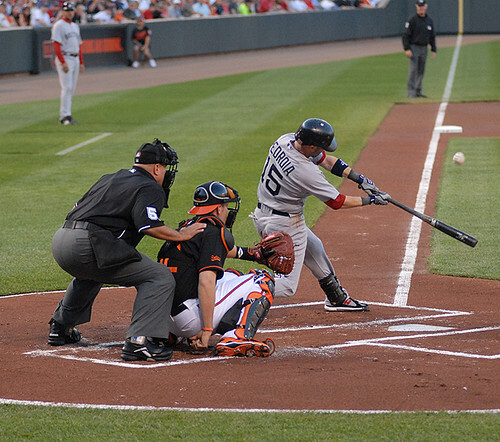 The Orioles fell to 2-15 on Friday night as they lost the opening contest of a three game set to the Red Sox, 4-3. Once again, the Orioles could not score with runners is scoring position, the defense was once again shaky - Miguel Tejada had two errors, and the bullpen inexplicably could not get the job done. You want to know why Baltimore lost -- they left twelve on base and were 1-for-12 with men in scoring position. Baltimore trailed 3-0 in the game, but the offense finally put something together to tie the at game three in Boston in the top of the eighth inning. However, in the bottom of the eighth, the Orioles managed to load the bases with two walks and a single before the damage was done. In that frame, Matt Albers got into a bit of trouble and Will Ohman could not throw a strike at all. Then reliever Jim Johnson came into the game. He walked Adrian Beltre for the winning run and the Orioles could not come back in the ninth inning. They had a runner at second bases, but Julio Lugo struck out to end the game. But then again, the Orioles could have done more in the frame, but Nick Markakis had an opposite field single off the Green Monster, but got nailed trying to stretch his hit to a double. If all had gone well, the Orioles could had perhaps had Nick Markakis as the tying run. 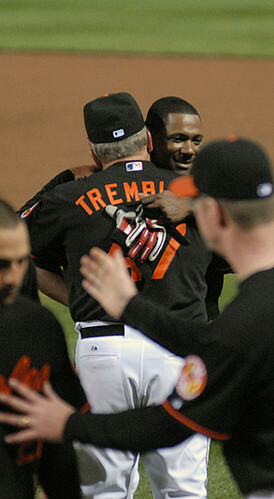 Yesterday, the Orioles players gave their manager some support through the tough start of the 2010 season. One player - Nick Markakis - said something that might really irk a lot of fans. "I don't think you can blame Trembley," Markakis said. "We're the ones out there pitching and hitting. I think he's done a good job overall. There's only so much a manager can do. The rest of it is up to the players. If you're going to point fingers, you can put it on my shoulders. I'm not swinging the bat the way I'd like to. "I think people are looking into it too much and pointing fingers, trying to blame this and blame that. I think people need to relax and the guys in here need to start realizing that it's a game and to have fun." Eh, Nick. No. As much as baseball is a game -- it's a huge business and a ruthless one at that. We as fans may live and die with the game, but the goal of a team (any sports team) is a make as much money as possible and win a championship -- or at least win more than they lose. The game of sports is a "what have you done for me business", and with the way the Orioles are playing now, Trembley - a good man - will more than likely take the sword for you all and find himself out of a job. As the saying goes, "you can't fire twenty-five guys..."
If the Orioles didn't have bad luck, then they would not have any whatsoever. Last night - again - the Orioles lost to the Mariners, 4-1, to be only be swept in their series out West and to fall to 2-14. The season so far has become a road to nowhere and as it is now, forget about .500 -- there are some people who probably need to worry about keeping their jobs. Baltimore manager Dave Trembley held a closed door meeting before the game and took his team to task; however, that did little good. I figure he should have done this all last week before the situation became absolutely heerendous. I don't think anyone ever thought the Orioles would be 2-14 after 16 games, but someone should have stepped up earlier to rally the troops and right this ship. Like I said yesterday, I see a team that's listless, has no plan or clue what to do at the plate, and at times lacks some serious fire. I mean seriously, by the time the Orioles come after playing in Boston, could they conceivably be 3-16? 2-17? The Baltimore Orioles have issues. Usually, I try to stay positive and not go on the attack like a pit-bull; however, the 2010 Orioles so far are not certainly not the team we were promised in the offseason. We all know that Brian Roberts is out and that's killing the offense, Pie is hurt, the $12 million closer is on the shelf and never got his footing, Miggy is ailing, and Koji Uehara has not been seen much at all. In light of the negative, the pitching for the most part is doing it's job, but right now the youth - that's right, the future - and some of MacPhail's acquisitions are killing this team. As it is, this team has little to no leadership whatsoever at all. Last night, the Orioles lost again for their 13th time in 15 games as the Mariners beat them again, 3-1. David Hernandez - who had a quality start and did his best humanly possible to keep his team in the game - took the loss, his second on the year. He went 6 1/3 innings, allowing seven hits and three runs. He got touched up for two runs in the first inning off a Franklin Guiterrez sacrifice fly and Milton Bradley RBI-single. Hernandez would settle in and roll until the seventh inning, but would give up his third run of the night of a Jack Wilson RBI-double and his night was done. At this point, do Baltimore pitchers have to throw shut-outs to win? The Baltimore offense could not bail Hernandez out. Aside from a Nolan Reimold RBI-double off the center field wall in the first inning, the team didn't do squat thereafter. On the night, the Orioles were 0-7 with runners in scoring position and only had four hits. Tonight the Orioles sit at 2-12 about to take the field against the Seattle Mariners hoping to force a rubber match for tomorrow. 2-12, never in my wildest, darkest, nightmares would I have thought to see the Orioles be 2-12 it just defies explanation. Everyone is just sitting, waiting, hoping to see the Orioles bats break out of their collective slumber. But how long can we wait? It is getting rough in Baltimore. I am, quite possibly, the biggest Orioles fan at my workplace. Normally this gets me little attention outside of opening day and maybe the odd mention. But with this, I have been asked no fewer than five times a day since the Orioles notched their fifth loss: "What is wrong with your boys?" Listen people - I don't know! No one knows. They aren't hitting, the bullpen is spotty, last year's Rookie of the Year candidate just got busted back to the minors. Our closer, second-baseman, third-baseman and left-fielder are all injured. Half of the infield is out of position we aren't getting any bounces. No line drives are finding grass and every mistake the Orioles make immediately seems to result in nine runs. Peter Schmuck wrote, only half joking, that the Orioles might be cursed. Whatever may be curisng them, I don't know. Perhaps there is some twisted supernatural cabal that is pulling the strings. What remedy do they require? How shall we give them satisfaction? Sacrifce? I nominate Ken Rosenthal. Perhaps we just need to make sure Ceranno gets a LIVE chicken for a change? After a nice win on Sunday in Oakland, the Orioles tried their best to put the losing behind them on Monday in Seattle, but could not. When the night was over, Baltimore had lost it's 12th game of the season as pitcher Doug Fister and his brilliant night on mound helped Seattle win, 8-2. Once again, the Orioles were killed by a lack of offense, horrible defense - a huge error Ty Wigginton in the third inning opened up the flood gates - and a pitcher who has clearly struggled from the gate this season. Pitcher Brad Bergesen, who shined during his rookie season, has not regained the success he had in 2009 and once again got shelled. His night in Seattle: seven runs given up -- four earned -- on six hits and three walks in 2 2/3 innings. His reward: Bergy will try to figure out things in Norfolk. He's not fooled anyone in his three starts so far this season and who knows if his failures so far are due to his leg injury or his crazy commercial taping in the winter? Pitcher Alberto Castillo will be brought up from Norfolk and will suit up tonight for the O's. Seattle put up a seven spot in the third inning, highlighted a 3-run homer by Casey Kotchman to pretty much decide the game. Boy, are the Orioles having a hard time. The team has Brian Roberts on the DL along with Koji Uehara, Mike Gonzalez and now there's another name on the list: Felix Pie. The guy who was perhaps the hottest player on the team aside from Ty Wigginton is now on the shelf ... for about three months. In addition, Roberts will be sidelined for a few more weeks. From the Baltimore Sun's Orioles Insider: So much for the good sentiment surrounding Sunday's win and the end of a nine-game losing streak. The Orioles learned today that outfielder Felix Pie will be out for at least three months after he tore the latissimus dorsi muscle off the bone. Pie, whose injury was initially classified as a strained muscle in his upper back, had a magnetic resonance imaging performed today and then visited another doctor, when the diagnosis was made. "The prognosis is just to rest, no surgery needed," said Orioles president of baseball operations Andy MacPhail. "But the probable time when he can return, we’re probably looking at three months. [The severity] did come as a surprise to me. He thinks he did it on Opening Day when he threw the runner out at the plate and then he's had periodic issues since. It is certainly disappointing from our standpoint. It is the one area where we felt like we had depth, but it’s disappointing for the kid and disappointing for us." This morning, Cal Ripken issued a release to the media due to Ken Rosenthal's story that came out over the weekend concerning a report that he was declined a position with the Orioles by Peter Angelos. “In my baseball experience, rumors and stories seem to break when things aren’t going well. Let me address recent media reports. “First I want to say that Mr. Angelos never said that he didn’t want me to get credit for any success that the club might have. That’s just not true. “I have had a very good relationship with Peter for a long time. He has been an advisor to me, a great supporter of my foundation and it is because of him that we have an Orioles affiliate in Aberdeen. “I have met with Andy and Peter on a number of occasions to discuss many subjects. Ultimately our discussions have turned to baseball, the Orioles and me. I have enjoyed those talks very much, and yes the subject has been broached about me potentially joining the organization. I look forward to those talks continuing. I guess the speculation whether Ripken will join the Orioles or not will continue. The Orioles snapped a painful nine-game skid as they defeated the Oakland A's, 8-3 on Sunday. Instead of worrying throughout the game, fans finally got to see a decisive win by Baltimore as hurler Brian Matusz went 6 1/3 innings and kept the A's at bay until the fourth inning, where they plated a run. Overall, he got his second win of the year, as he was charged with three earned runs in his outing. Ty Wigginton once again carried the Orioles as he was 2-for-4 with four runs driven in, including a two-run double in the third inning and a two-run homer in the ninth. Baltimore's other runs came via a Nick Markakis RBI-single in the third, a Lou Montanez RBI-single in the fourth and a Nolan Reimold two-run double in the fifth. Saturday was once again painful for the fans. The Orioles once again found another way to lose as Ryan Sweeney's walkoff two-run single in the ninth inning off Jim Johnson helped the Oakland A's win 4-3. Johnson - who struggled last year in the closing role with the Sherrill trade - threw two wild pitches and loaded the bases to give Sweeney the opportunity to become a hero. The bullpen once again blew it and now the Orioles are the worst team in baseball at 1-11. They have lost nine straight in a row. If they needed even more bad news, Miguel Tejada hurt himself in the fifth inning as he was running from the batter's box and was writhing in pain; however, he says he's fine, but will miss a few games. Baltimore has lost 11 out of 12 games to start the season, and this time around, the defeat was tragic. They once again started off behind as Oakland had a 2-0 lead; however, Garrett Atkins finally came through at the plate as he hit a two-run double to tie the game in the sixth. The Orioles took a 3-2 lead in the eighth inning as Ty Wigginton - perhaps with the hottest bat on the team right now - drove in a run with a sacrifice fly. Cal Ripken Jr. has not offered himself to the Baltimore Orioles as a prospective employee, team owner Peter Angelos said Saturday, adding that if Ripken wants to be part of the organization, he'd be happy to sit down and talk with the Hall of Famer about a job. Angelos was responding to a FoxSports.com story that he turned down the opportunity to hire Ripken, who spent all 21 of his major league seasons with the Orioles. "Quite simply, Cal Ripken did not offer to become part of the Oriole organization in any secondary position, such as manager or as an assistant to [team president] Andy MacPhail, or in some kind of support role of MacPhail," Angelos said. "If he wants to make such a proposal, I'd like to hear about it." Ripken and the Orioles are collaborating on a youth baseball academy in Sarasota, Fla., and in the midst of a discussion about that subject, there was talk about having Ripken serve in some capacity in spring training. That did not lead to a job for Ripken with the Orioles, but Angelos indicated repeatedly Saturday morning that he'd like to talk to Ripken about whatever ideas he has. "I see Cal often, and I consider him a friend," Angelos said. "From a standpoint of rejecting Cal Ripken, that's an impossibility. If this [story] is coming from him, I'd like to sit down and talk to him." Within the FoxSports.com story, a source is cited as indicating that Angelos told Ripken, in a private conversation, that he did not want to hire him because Ripken would get credit if the Orioles' fortunes on the field turned. "That's absurd," Angelos said. "Even if someone harbored such thoughts, I think common sense would tell you that they wouldn't be crass enough to express that." This season is so far tough to stomach. So much promise to start the year is down the drain. Friday night, Baltimore lost to Oakland, 4-2, for their eighth loss in a row. Aside from Ty Wigginton's long two run homer in the fifth and Kevin Millwood keeping his team in the game on the mound despite a rough start, it was the same old story again - the offense couldn't get anything done. The 1-thru-4 hitters only went 2-for-16 on the night ... and Nick Markakis had both of them. Despite the lineup change - sans the performance of Nick Markakis and Ty Wigginton - nothing came of it. As for the A's -- they got their offense going early, scoring once in the second and third innings, and twice in the fourth. That's all they needed. Cal Ripken Turned Down For Job With Orioles? A special tip of the hat to WNST's Nestor Aparicio for posting this about the Orioles and Ripken. The Orioles have had a lot of problems for years and to hear that Cal Ripken - for one reason or another - was told 'no thanks' for a front office job within the organization is galling. This was first reported by Fox Sports Ken Rosenthal. After reading this, the thoughts in my head were, "you must f**king be kidding me, right". The Orioles, losers of nine of their first 10 games, could use a little help. Yet, owner Peter Angelos recently declined to hire the franchise’s biggest legend, Hall of Famer Cal Ripken Jr., in a baseball capacity, according to multiple major-league sources. Angelos, however, nixed the idea in a separate conversation with Ripken, telling him, according to three sources, that he did not want Ripken to receive credit once the team returned to prominence. Ripken did not discuss a specific role with MacPhail, one source said. However, another source said that Ripken wanted to work with young players such as catcher Matt Wieters and help them “finish off” their developments at the major-league level. Ripken and MacPhail, according to that source, agreed that their relationship could be mutually beneficial. Ripken would have helped MacPhail with his vast baseball knowledge. MacPhail would have helped Ripken learn the administrative side of the game. Angelos, however, was reluctant to create any perception that MacPhail was not fully in control, a source said. I honestly don't know what to say anymore, because the Orioles play is just befuddling. These guys could not buy a break right now. Seriously, if there was a break-store the Baltimore Orioles would not be allowed to walk in, place five dollars American on the counter and state: "One break, please." And instead of receiving said break the moustachioed clerk will simply sneer and state "our kind" isn't welcome here before giving the Orioles the "bum's rush" out the door. All whimsy aside this is simply ridiculous. I am only 27, I have vague memories of 1988 the now fabled and historic 0-21 start. In 1988 a team that included Cal Ripken Jr., Mike Boddicker, Scott McGregor and Eddie Murray started the major league baseball season and played 21 games before getting their first win. I don't "remember" 1988 game-by-game, I was only five, I remember feelings. I remember my Dad being angry, I remember it being easy to go to games. I remember a general sense of malaise and disgust (yes I did know what those things were in 1988 - shut up) but I have to imagine the games in 88 had to have looked a lot like this. The Orioles are off to the worst start in recent memory. There is nothing else to say. The Orioles are the definition of "snakebit", nothing seems to be going right. Sitting in the park last night I thought for sure that the Orioles would win that game. Luke Scott hit that absolutely clutch homerun and I KNEW we would win. But then - well - yeah. All of those looking for heads to roll, thankfully Andy MacPhail has a much cooler head. “I don’t even know how to begin to answer that. We are nine games into [the season],” he said. At least someone has a cool head. It has been rough O's fans - really rough. Thankfully, it can only go up from here. Go Birds? Seriously, I'm going to bed - ugh. Gonzalez Shelved; Rays Sweep & Are the O's Really This Bad? After everything that has gone on with Mike Gonzalez from Spring Training until now, is anyone surprised at the news that came out this afternoon. I've watched enough National League baseball and remember Mike Gonzalez pitching in relief as an Atlanta Brave to know something was wrong when I saw him last week. From the Orioles.com: The team announced that Gonzalez is suffering from a strained left shoulder, and the move is retroactive to Saturday. The club said it would announce another roster move later on. Baltimore manager Dave Trembley said before the game that Gonzalez had warmed up during Tuesday's 8-6 extra-innings loss to the Rays but said he couldn't pitch. Gonzalez had problems in his first three games. He lost ninth-inning leads twice and barely escaped when he did get a save. Let's hope Gonzalez's injury isn't more than just a strain. A 1-7 record now. Five straight losses. Every game was potentially winnable, for the most part. Really, Opening Week has not been good to the Orioles. They been trashed on the radio, online and wherever else for the past few days, but on a cold Tuesday, they fought and fought. The Orioles frankly aside from the pitching staff (sans Mike Gonzalez) have not been good. So, on Tuesday they decide to shake things up and wear not only their orange batting practice jerseys and their Friday night O’s cap. More importantly, they had young Brian Matusz on the mound and on Tuesday he showed why he’s been so highly thought of throughout baseball. What was a great game for fans – sadly – until the tenth inning thanks to a shaky bullpen became another script we’ve seen before as fans as the Orioles lost to the Rays, 8-6. Carlos Pena’s tenth inning three-run homer off Oriole reliever Matt Albers in the tenth. Tampa reliever and former Oriole Lance Cormier earned the win. Rafael Soriano earned the save. Matusz was cruising throughout the game and by the time the seventh inning ended, he was in line for a special night. Watching the game, I thought, maybe it would be a nice time for Matusz to leave the game in the seventh – you know, have him go out on a high at home. The crowd was into it, Matusz was in control and the Orioles were heading for a win to end the four-game skid. Then the Orioles got bit in a game. Again. Eh, then the eighth inning came and things changed quickly – very, very quickly. Matusz perhaps tired and fell out his groove. The hits came for Tampa and one run in the start of the frame became five. All the runs were scored on three singles from Sean Rodriguez , Evan Longoria (2 runs), Carlos Pena and a double from B.J. Upton. The Oriole bullpen didn’t do its job and bail Matusz out. 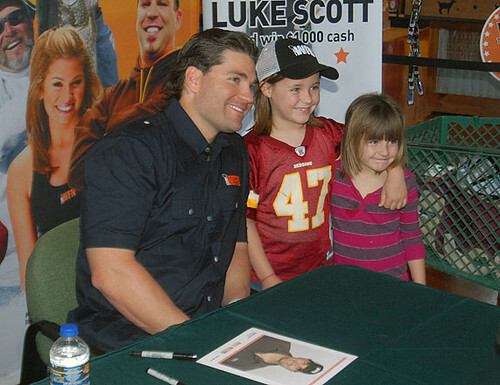 On Saturday, fans of the Orioles – and fishing – got the chance to have a meet and greet/autograph session with Luke Scott at the Bass Pro Shops at Arundel Mills Mall in Hanover, Maryland. 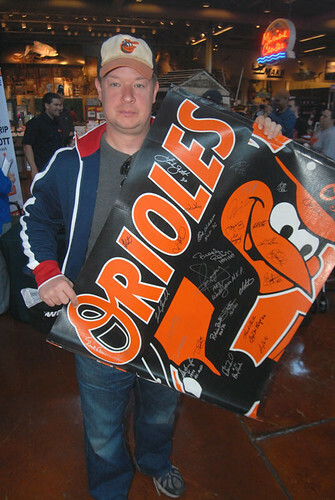 Fans lined up early to get a glimpse of the Baltimore Orioles fan favorite and after a painful home opener loss on Friday, the slugger brightened up many in attendance. As it is, Luke seemed to be very appreciative of the attention and the effort of the fans that came out to meet him. Luke – unlike some athletes, who I have observed over the years – took his time to have some small talk with fans, engage with them, and also feel at ease. Amazingly, he signed anything – and everything given to him. All in all, about roughly 250 fans – a strong number for an event like this – waited in line for a chance to meet and get a John Hancock from him. Saturday’s event was held in conjunction with the World Fishing Network and their latest promotion, which featured Luke Scott. WFN’s Luke Scott promotion allows fans to enter online for a chance to fish with the slugger, receive a cash prize plus other goodies. Garza Has The O's Number Again; Baltimore Loses 5-1. Time For Change? For the second time in as many weeks, the Orioles countered with the Rays and pitcher Matt Garza. Well, once again, the Rays got the Orioles’ number as their bats came alive later in the game and Garza once again pitched another gem. In the end, the Orioles lost to the Rays, 5-1. I got home around 8:30 and turned on MASN and noticed the amount of open green seats to people actually seated. There were not a lot of people at Camden Yards on a surprisingly great night to watch a game in April. Sad. Oh yeah, the Orioles are now (1-6) to start the season and have lost all four games on their first homestand so far. Only the Houston Astros at 0-7 are worse than the Orioles in all of baseball. Then again, it doesn’t help that the Orioles are the worst in the American League right now. Felix Pie’s leadoff homer was the only run the Orioles had on Monday. Garza went eight innings, struck out five, walked three and allowed six hits. On the other hand, Jeremy Guthrie once again had a solid outing, but took the loss – his second on the year. He went seven innings, allowed three runs, struck out five and walked none. It was a shame that the Oriole bats were once again asleep for evening, and they went 0-for-3 with runners in scoring position. Today was the second annual Blogger Day at the Yard. The Orioles and MASN once again pulled out all the stops to show us members of the "new media" a good time. And when I say stops were pulled out - I mean they were pulled out. Press credentials, full use of the MASN suite, complementary drinks and food of all kinds, meet-and-greets with all sorts of personalities (more on that later) and of course free baseball. The game, unfortunately, was another forgettable loss. An excellent performance from Millwood stymied by a complete lack of any offense and one key error at third from Miguel Tejada. The lack of Orioles offense is, disturbing, but more on that later. The biggest surprise of the day came around the fourth inning. Sitting outside watching a wonderful game in great weather our MASN representative (Ty) pops his head outside and asks: "Anyone want to say hi to Andy MacPhail?" That is right, we were given audience with the big guy. As I said, stops were pulled. As we speak right now, a very tired, Anthony Amobi is pouring over audio and video recordings and a recap of the improptu press-conference is forthcoming. Stay tuned to the Post for more. It was great seeing all my fellow blogger-nauts in person yet again and hopefully we will all have something good to report in the coming weeks. As for the game - well, as I said above it was forgettable. The Orioles offense continues to scuffle in the worst way possible. The Orioles batters were able to get two quick runs in the first as they strung together some timely hits, and were helped by a tough Blue Jay error, but the bats went silent after that. Watching the Orioles go through this is kind of hard. You keep expecting them to break out of it at any second. It seems that somebody is bound to launch a three-run homer or get that timely double, hell we would all settle for a dying-quail over the shortstop's head at this point. But as of right now those key hits are not coming and it is maddening. For the Orioles, it’s been well .. a bad week. Aside from the Sunday curse continuing, the Opening week ended with a disappointing thud as the Blue Jays won this afternoon, 5-2, to complete the weekend sweep. Until the seventh inning, all was good on a nice, sunny day in Baltimore. Ace Kevin Millwood, who was making his first start at Camden Yards as a member of the Orioles, showed why the top brass thought so highly of him to make a trade with Texas in the off-season. For 7 2/3 innings, Millwood (0-1) was the man on the mound and held a 2-1 lead for Baltimore; however, back-to-back homers by Toronto’s Jose Bautista (a 2-run shot) and Alex Gonzalez (solo) did the Orioles in. The Jays added an insurance runs and put the nail in the coffin on Sunday as Edwin Encarnacion hit a solo homer to give the Jays 5-2 lead. Kevin Gregg pitched a scoreless ninth for his second save of the year. Baltimore got on the board in the first inning, 2-0, thanks to an RBI-double by Miguel Tejada and a Luke Scott RBI-groundout. After that, the Orioles were handcuffed by the Jays and would not score after that. Despite getting nine hits, the Orioles were once again stymied on the offensive front, going 1-for-8 with runners in scoring position. Shawn Marcum – who started the game for Toronto – earned the no-decision, and Casey Janssen (who pitched in relief during the 7th inning) got the win. He is 3-0 on the season. Last night the Orioles fell to 1-4 after being shut down by crafty left-hander Dana Eveland. The Orioles seem to make every left-handed pitcher look crafty. The offensive disappearing act spoiled a great six-inning 2-ER performance from David Hernandez. Hernandez showed why he made the team out of ST last night. He worked quickly; he threw strikes; he got out of jams with minimal damage; he pitched a great game. It was the best performance from an Orioles starter this first time through the rotation. And the Orioles spoiled it. But you know what, I am not even that upset about it. Games like that are going to happen. You are going to have nights where you just don't have an offense and lose 2-0. That will happen to the Yankees, Sox and Rays as well. That, my friends is why you have to win the games you are supposed to win. If our new closer had gotten the job done then we would be sitting at 3-2 and not really worrying about this petty loss. But, because you didn't win the games you were supposed to win, here we are. Enough has been written cursing Mike Gonzalez to the inner-most circle of Hell reserved for mutineers, traitors and ineffective closers so I do not feel the need to heap more onto the pile. Gonzalez knows he has to put some serious work in before his next appearance so he will be working with Kranitz in the bullpen to get this figured out. I think I smell a phantom injury coming on. We are only four games into the 2010 and already there’s some serious angst in Birdland. In the Orioles’ home opener, beleaguered closer Mike Gonzalez once again had trouble on the mound and unlike yesterday, he could not find his way out of trouble. For the second time in three games this season, he blew a save and the Orioles found themselves in the loss column against the Toronto Blue Jays, 7-6. From the AP: Then, for the second time in two games, Toronto rallied in the ninth. Gonzalez walked leadoff hitter Edwin Encarnacion and threw a wild pitch before yielding an RBI double to Snider. After a bunt by John McDonald moved Snider to third, Jose Bautista hit a sacrifice fly. Gonzalez (0-2) was then removed -- and jeered as he walked to the dugout. Signed as a free agent during the offseason, Gonzalez has two blown saves in three chances and loaded the bases in the only save he converted. He has allowed four runs, four walks and five hits in two innings. The Associated Press account of Gonzalez’s outing was understated – the man was literally booed out of the stadium and replaced with Cla Meredith. Once the deciding frame ended, the Blue Jays had a 7-6 lead and held out as closer Kevin Gregg retired the side in order to end the game. The home opener is just a few short hours away and I'm sure everyone is gettign ready for the festivities and the game itself this afternoon. It's too bad that the temperatures have dipped by close to 25 to 30 degrees since yesterday, but it's nice to see baseball again on your home turf. 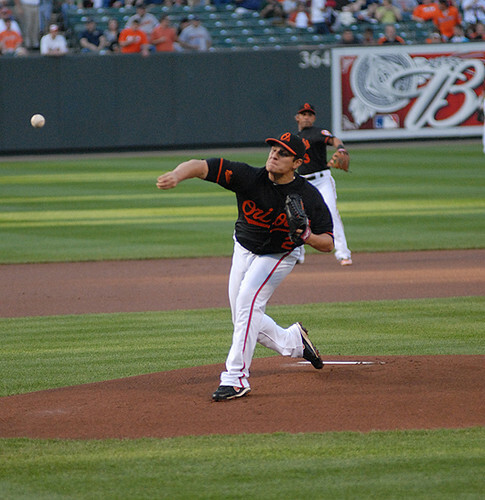 Today, Brad Bergesen will be on the mound for Baltimore against Toronto's Brandon Morrow. Last night, the Orioles finally won their first game of the season defeating the Rays, 5-4. Once again; however, in the ninth inning, Mike Gonzalez decided to make things very, very interesting. It looked like he may have gotten Tuesday's monkey off his back initially by striking out the first two batters, but then decided to take all us fans on a thrill ride. From the Orioles.com's Brittany Ghiroli: With the Orioles clinging to a one-run lead and three outs to go, Gonzalez struck out the first two batters he faced before issuing a pair of walks, with Jason Bartlett's single sandwiched between. Manager Dave Trembley watched the go-ahead run standing on second, prepared to insert sidearmer Cla Meredith if Tampa Bay's Ben Zobrist reached base. But Gonzalez didn't let it get that far, getting Zobrist to fly out, securing the save and preserving the "W" for rookie starter Brian Matusz, who gutted out a solid five innings in his 2010 debut. Gonzalez saved the win for Matusz -- who went five innings, was charged with two runs, but walked five. Let's hope that Gonzalez doesn't bring back the days on Don Stanhouse (for all of those old-school Oriole fans out there). The Orioles on Wednesday night lost their second consecutive game of the season at the hands of the Rays, 4-3. In yet another close loss, Evan Longoria once again touched up the Orioles thanks to a two-run double in the 5th inning that gave Tampa a 3-2 lead. He struck again with a long home run in the 8th that gave Tampa an insurance run and would be enough of a cushion. Of course, with Pie out with a shoulder issue, Reimold was in left field on Wednesday. As we know, Nolan is trying to come back from a serious leg injury. From my point of view, it still looks as if his running ability is still hampered. I bring this up because perhaps if Pie was out there, he might have caught Longoria’s double that perhaps should have been caught by a more-fleet-footed outfielder. Baltimore had their hands full against Matt Garza (1-0) as he went eight innings and gave up two runs – one earned. Garza struck out nine and would walk two. The Orioles scored twice on Garza in first inning as a Miguel Tejada had an RBI-single and Nick Markakis would score on an error. However, after the opening inning, the bats for Baltimore would be rendered quiet until the ninth inning as they came within one run, 4-3, thanks to a Garrett Atkins RBI-double to plate Matt Wieters. This week, the blog sent some questions to Greg Bader - Director of Communications of the Baltimore Orioles - as a follow-up to a Q&A we did in mid-January. The topics touched upon in this Q&A include thoughts on the Orioles first Spring Training in Sarasota, a little bit on what fans should expect at Camden Yards on Opening Day, ballpark improvements, promotions and fan perception. Now that Spring training for the Orioles in Florida has come to an end, what was the reception and feedback like in Sarasota with the locals? As well, what's in store for fans at Ed Smith Stadium in years to come? Our first spring in Sarasota exceeded all of our expectations, in terms of not only attendance figures, but the way in which the entire community -- its citizens and business and political leaders -- embraced the club as its "home" team. We set an all-time attendance record for the Orioles in our Grapefruit League facility (over 102,000 fans) and this was also the 2nd highest attendance ever in Sarasota, which demonstrates it was the combination of team and community which helped achieve these results. We believe this first year is just the beginning of what will be a mutually beneficial 30-year relationship. We are hopeful that beginning in the next month construction will begin on the renovations we have planned for the complex. If that happens, the new facility will be ready in time for Spring Training 2011. Artist renderings of the changes are available at Orioles.com if you wish to take a look. The new facility will provide all of the modern amenities fans expect at an MLB game along with the charm of spring training baseball. Have there been improvements made to Camden Yards during the off-season? Are there any new places, features or things for fans to be informed of heading into Opening Day and 2010? The major changes involve several maintenance issues that the Maryland Stadium Authority tackled as part of their deferred maintenance program this offseason. One such item was that all of the seats in the lower level from foul pole to foul pole were replaced, with all seats having a high back and cupholders, and seats between the bases having cushioned seats as well. Several concessions changes have taken place, including the arrival of one of Baltimore's favorites, Attman's Deli, to replace Pastimes Cafe in the Warehouse. Other local businesses such as the Greene Turtle, Hightopps and Pickles Pub will also be featured at various locations inside the park. On the club level, there was a significant change to the entrance behind home plate, where a large trophy case was installed in the concierge area that will display the various awards and trophies the team has won over the years. Nearby we are opening a market-style dining food option called the All-Star Cafe (where Diamond Bistro used to be). On that note, Opening Day from what I know is completely sold out. What should fans be looking forward to that day before the game? Yes, we are sold out and we're looking forward to a packed house to not only cheer on the 2010 team, but also to give our first-pitch honorees, Brooks Robinson and Boog Powell, a huge ovation. We suggest that fans are in their seats by 2:30 for the approximately twenty-five minute ceremony which will include the traditional centerfield orange carpet entrance for the team. We will also pay special tribute to the 15 members of the Orioles family who passed away since Opening Day last year, including Mike Cuellar. Luke Scott will be available for select media interviews. Media - please RSVP in advance. New closer Michael Gonzalez got the first out in the bottom of the ninth inning nursing a 3-2 lead. He was unable to complete after giving up a single, double and loading the bases with an intentional walk; "Cobra" gave up a game winning single to Carl Crawford. The ninth inning collapse soured a great performance from the rest of the team. Jones, Wieters and Scott all hit homers, accounting for the Orioles' three runs. Miguel Tejada had more than a couple slick plays at third. Kevin Millwood pitched a solid five + innings and the rest of the bullpen looked solid. Both teams had a terrible night with RISP. The Rays and the Orioles left a ton of men on base. The most glaring was in the top of the ninth where the Birds got a double from Atkins and a bunt single from Izzy to start the inning. Roberts grounded into a FC, Jones grounded into a FC and a walk to Markakis loaded the bases. With two out Tejada worked the count and with it full absolutely roped a line drive right at the left-fielder. I mean you can not hit a ball harder than Tejada hit the ball. Ladies and Gentlemen. Friends, well-wishers, Baltimoreans, internet. I stand before you today, not as a cheerleader, but as a leader. For too long my friends the Orioles and their fans have been at the bottom of the ranks in baseball. We have been laughed at, ridiculed and mocked. We suffer constant assaults on our character and persons when certain other teams come to town. And when we have the unmitigated termerity to stand up for ourselveswe are lambasted and called "un-American." Why? Because we are tired of being oppressed? Are we "un-American" because we failed to properly curtsy as the lesser-nobility that make the Yankees come to town? Because we haven't been properly assimilated into the unstoppable marketing juggernaut that is the Red Sox Collective? If that is the way some wish to view us, then so be it. We are unique. We are strong. We are Baltimore. Suffering from stomach cancer former Orioles pitcher Mike Cuellar passed away yesterday in Florida. Cuellar was famous for being in one of the greatest rotations that has ever been. In 1971, on their way to another World Series, Cuellar joined Pat Dobson, Dave McNally and Jim Palmer in a rotation that saw each of them win 20 games. A four-man rotation all 20-game winners. That is something we are not likely to see ever again without drastic changes to the dynamics of today's game. * Only three other teams in the since that Orioles rotation have seen multiple 20-game winners, only one team has done it since 1980. * Above that, no team has had more than two 20-game winners. With only mere days heading into the 2010 season, I’m excited for baseball, but at the same time really concerned about one aspect of the team – the pitching. Yes, it is Spring Traning, but aside from Kevin Millwood (as a proven commodity), and Maybe Brian Matusz, who knows what else we’ll see heading into the season? Jeremy Guthrie has had his struggles this spring and this time around he cannot blame the World Baseball Classic or not having the ability to work with his coaches. Well, Spring Training results for some don’t matter; however, for Guthrie, let’s hope his struggles in March aren’t a harbinger of things to come. Right now, he’s slotted as the number two starter and if he is anything this upcoming season like he was last year, it’s not going to be good for Baltimore. I thought this was an April Fools joke when I first heard of it, but it's very much true. It looks like the Orioles have made a trade with the St. Louis Cardinals for a guy that knows the American League East all too well as they have traded for Julio Lugo. Remember, he spent the first part of his career with Tampa Bay, and also has spent time with the Red Sox. Although Lugo's defense has been questionable over the years, he's fleet-footed on the bases, has hit for a decent average and shown some power. I certainly would consider Lugo an upgrade over Andino (who is now off the 25-man roster) and certainly is another decent bat coming off the bench. Meanwhile, it looks like backup catcher Chad Moeller is no long part of the Baltimore organization. Moeller lost his position to rookie Craig Tatum out of camp a few days ago, and he was not happy about it. The Orioles tried to get another team to take him on, but there were no takers. His value behind the plate came as a tenured veteran, who could help out the young staff and also Matt Wieters. However, the Orioles might have felt now that Matt is to handle things himself and Moeller's arm behind the plate doesn't compare to Tatutm's abilities defensively.